Capital Equipment Hire is an independent supplier of professional cleaning equipment and after sales support. Our range of equipment includes sweepers, scrubber dryers, carpet extractors, vacuum systems and pressure washers and are available for purchase or hire. Capital Equipment Hire has an extensive range of professional cleaning equipment from selected international brands that are available for purchase or hire, hire from 1 day to 60 months. We utilize many years of industry experience recommending and offering the most efficient models from world leading brands to our valued clients, striving for their total satisfaction in cleaning performance while containing operating costs. We are an Australian Distributor for Fimap Cleaning Equipment and premium dealer for the class leading Nilfisk Professional Cleaning Equipment which includes Gerni, Viper and Kerrick brands. Our floor care range consists of various size Sweepers, Scrubber Dryers, Combination Sweeper Scrubber Dryers, Carpet Care, Pressure Washers and Vacuum Systems for commercial and industrial applications. Connect with us today on 1300 799 312 or sales@capitalequipment.com.au. We understand the importance of having replacement parts readily available that are dispatched quickly to ensure your machine is performing at the highest level, allowing you to obtain the most value from your investment. We have an extensive range of genuine replacement parts available and are continually refining our stock levels to meet our customer’s ever-changing demands. Our ERP system monitors stock levels, assisting us with important information to stock the most common parts and adjust future volumes. We maintain a network of suppliers and direct connection with the manufacturer to increase response times. Weekly air freight orders are placed for those unusual items and to replenish local stock levels; rare or bulky items may attract an additional cost for air freight when required. We also source and test non-genuine substitutes to OEM components to offer low cost alternatives, providing they offer value and meet our strict quality control procedures. Order from our online shop or contact our parts department on either 1300 799 312 or parts@capitalequipment.com.au for personal assistance. 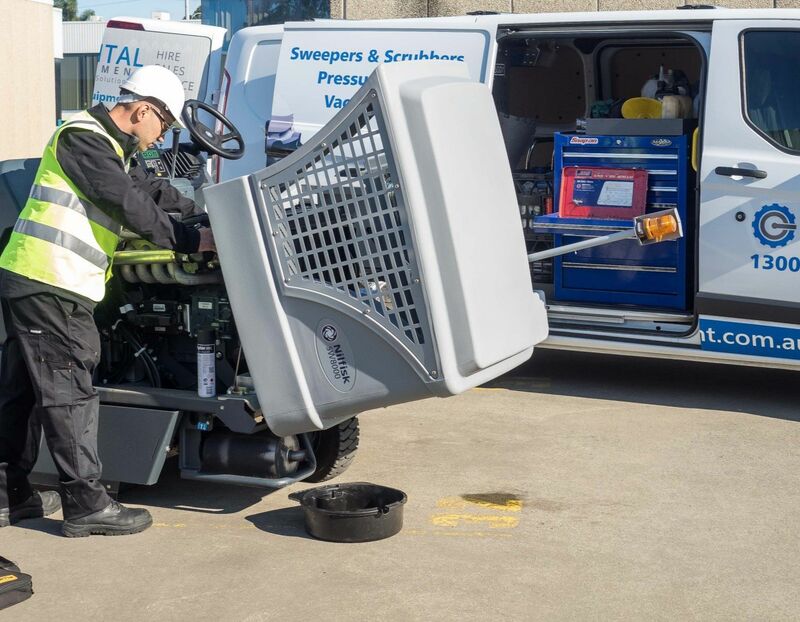 Capital Equipment Hire has built a strong reputation within the cleaning industry, offering unrivalled service and back up support to our customer base since 2004. We understand the importance of quick response times and effective service programs to keep down time to a minimum. Our new state of art workshop facilities designed to conduct major repairs or refurbishment of your cleaning equipment in a cost-effective method providing value for your investment. Our experienced factory trained service technicians and mobile service vehicles complete on-site periodic maintenance and repairs. For the total management of service and repairs of your sweeper, scrubber dryer, combination sweeper/scrubber dryer, carpet care equipment, commercial or industrial vacuum system and high-pressure washer machines, contact our friendly service department today on 1300 799 312 or service@capitalequipment.com.au. Our administration team is here to assist and help you with any enquiries or questions. We are continually refining our processes to provide simple and detailed information quickly with the goal of assisting you with the information required while reducing our ongoing business overheads to deliver more value for less investment. The recent introduction of a total ERP software solution connects all areas of our growing business and provides better access for our customers to shop and track orders online, retrieve invoices, access purchase history, view quotations, download equipment information and provide the ability to complete quick and easy payments 24 hours, 7 days a week. Our team members are on hand to assess your needs, issue quotations, provide casual or long term hiring options or tailor-make an arrangement for your individual business needs. Contact our administration team on 1300 799 312 or admin@capitalequipment.com.au. We are well versed in arranging equipment and replacement parts delivery throughout Australia using various methods. Free delivery for purchases over $ 500 in value, purchases below $ 500 attract a small delivery fee which is calculated at the checkout. It is important to note that seasonal surges may reduce delivery times, so please allow longer times during peak periods. Please contact our friendly staff for more information if required. At all times, it is our desire that you are satisfied with your purchase and supplied the correct item quickly. If you need to return a product a 20% restocking fee will apply and is available within 14 days of purchasing. Electronic items such as motors, control boards, user interfaces, etc are non-returnable so please ensure you obtain and select the correct part number for the required model and serial # from our Parts Lists prior to purchasing, please contact our team with any assistance required so we can strive to supply the required product quickly. Capital Equipment Hire may replace, repair, or refund any products with defects. However, Capital Equipment Hire reserves the right to refuse replacement, repair or refund if you purchased the product fully aware of its defects. Capital Equipment Hire may also refuse replacement, repair, or refund if damage is caused by your misuse or mishandling of the product. Please contact our team on 1300 799 312 or admin@capitalequipment.com.au for assistance or further information on returns. Capital Equipment Hire product warranties vary from brand to brand and from product group to product group. Equipment is supplied with a minimum of 12 months warranty although selected product groups are supplied with up to 36 months or 2000 hours parts providing regular periodic maintenance has been completed. Parts are supplied with a 6 months warranty from date of purchase. Your rights as a consumer are protected by the consumer guarantee. Please contact our friendly team on 1300 799 312 or admin@capitalequipment.com.au with any questions regarding warranty on your selected product or part. Products that are listed for a special price or listed in our heavily reduced Hot Deals area are non-returnable however are supplied with full manufacturer’s warranty unless otherwise specified. Please contact our friendly team on 1300 799 312 or admin@capitalequipment.com.au with any questions regarding products listed with a special price or within our Hot Deals area prior to purchasing. 1. I’d like to set up credit facilities, how do I do this? Please contact our administration team at admin@capitalequipment.com.au and request an account application. As a general rule, our accounts are assessed by a credit reporting agency once you have provided all the relevant information. You will be issued with an account #, login and password once your credit account has been approved which will allow you to upload purchase orders for the relevant parts or products. Unless you have an approved credit account with us, we do not offer credit facilities. 2. How can I simplify the ordering process for myself and my staff? Our website now offers you the ability to login and create an account. Your company’s details and ordering history will be maintained here, making it easier for you to repeat orders, download invoices and quotes. 3. How do I locate the correct part for my machine in the shop area? Simply enter the part # of the required item into the search bar located on the top right of screen, this will locate the item. If you are unable to find the required part, please email parts@capitalequipment.com.au so we can assist and upload if not listed in our shop area. 4. How do I identify the correct part # for the part I require? Simply enter the model # of your machine into the search bar located on the top right of the screen. Enter the machine product page by clicking on the image, scroll down and expand product information downloads, download Parts List and identify part #. Alternatively, information and image of listed replacement parts are listed on the machine product page. If you are unable to locate part # please contact our parts department on 1300 799 312 or send email to parts@capitalequipment.com.au so we can assist you further. 5. My order has arrived with a defect. What should I do? Please take photos of the defect and immediately contact our sales team on sales@capitalequipment.com.au Make sure you have a copy of your receipt and delivery docket. We will assess the damage and liaise with the courier to ensure we get the best result for you. Patience is key here, as we will need to understand where the defect occurred and work through the issue. Please do not send goods back to Capital Equipment Hire without our express permission whilst we are working on a resolution. 6. The machine I purchased is not from Capital Equipment Hire - will you still service it? Our technicians are skilled and experienced on various different brands and models of cleaning equipment. Please contact our service department on 1300 799 312 to discuss in detail. 7. What are your service and repairs costs? We offer a range of service levels, please make contact with our team on 1300 799 312 during business hours or email your request to service@capitalequipment.com.au for an estimation. Pricing will vary depending on your requirements, equipment and location. 8. I have requested a technician to attend site. How long will they take to arrive? We strive, measure and are continually improving our service response times, our aim to to attend site within 24 hours of receiving the request. It is important for us to resolve your issue quickly and cost-effectively. Please inform our service team the level of urgency so we can prioritize our workload, providing detailed information of the fault will allow us to plan accordingly and rectify the issue quickly. Our service team are on hand to assist you quickly, technical phone support is available for our valued customers. Contact us on 1300 799 312 or email service@capitalequipment.com.au. 9. I’ve found a cheaper price on machine model listed in your shop - how does your price matching work? We strive to offer our customers the best value and support on all of our product range, if you find the same identical product cheaper we will price match to ensure you are receiving the best value from Capital Equipment Hire. Please contact us sales@capitalequipment.com.au with a copy of the competitor’s quotation including, date, product description, specification and price. We will be in contact and match the price to ensure you receive the best value in the marketplace. 10. Are you able to supply a replacement machines whilst mine is being serviced or repaired? Absolutely. We have an extensive range of casual hire equipment available, please inform our service team at the time of service request. Contact our sales team on 1300 799 312 during business hours or email sales@capitalequipment.com.au so we can make the necessary arrangements for a machine to be delivered to your site. 11. What happens if I don’t receive my order? We are continually refining our process to minimize errors and to improve although unfortunately occasionally mistakes occur. If you think that an error has occurred in the delivery of your order, please contact our team here admin@capitalequipment.com.au in the first instance so that we can track the issue and resolve it promptly. 12. My delivery address is remote and I cannot guarantee that someone will be there to receive my goods. What should I do? When placing your order, please ensure that you list clear delivery instructions so we can forward to our delivery team and advise you the outcome. Please email any questions to our team, admin@capitalequipment.com.au. Can't find the information you're looking for? Get in touch with us!